Ami Lowman is not exactly a true ingénue in the field of fashion, illustration and jewellery, as she has been running Mia Mai for over five years now. However, when she was graduating in Fashion and Textile Design at Portsmouth University in 2006 she surely was. She had the initiative, however, to create a business plan in her final year and submit it to the Enterprise Challenge, a two stage competition run by the Portsmouth Centre for Enterprise (PCE), inviting all Portsmouth students to identify and develop an idea or different ideas which have commercial potential. She had to give a presentation accompanying her business plan and must have been quite impressive as she won the design category, which enabled her not only to receive some mentoring to help her launch the business, but also some cash to help start it up. So Mia Mai was born. 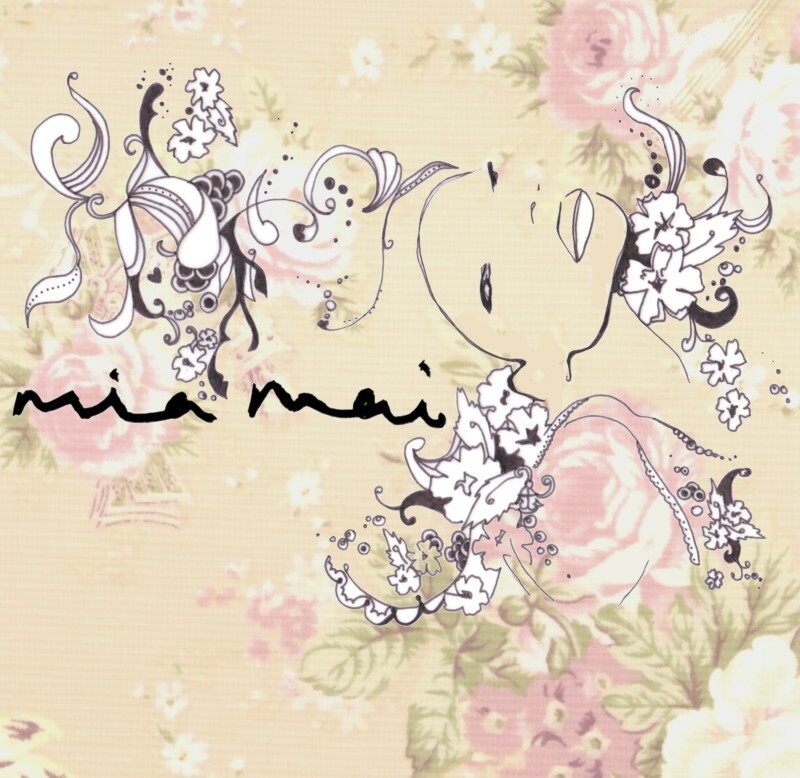 Mia Mai by the way is simply two anagrams of Ami – not as I originally imagined; I had thought it was perhaps a reworking of some enigmatic Japanese or Far Eastern phrase or saying. Just goes to show, never assume anything! 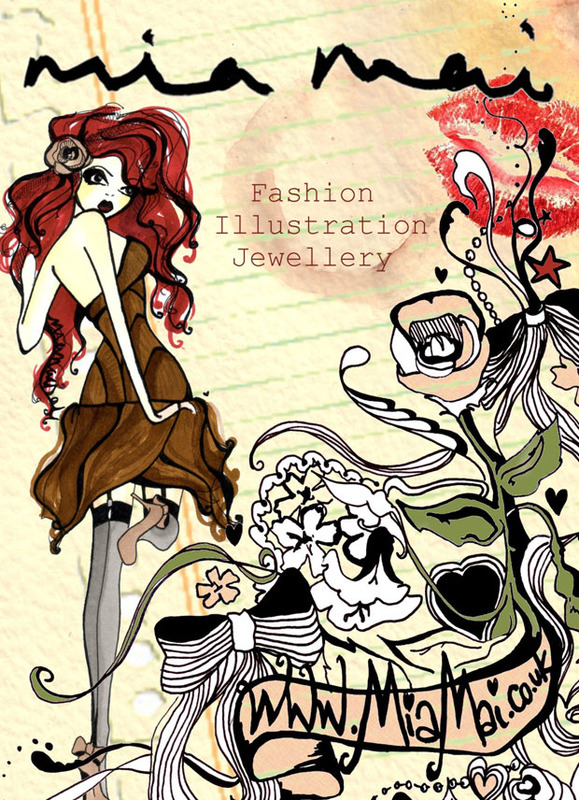 Her illustrations also are influenced by the vintage theme. 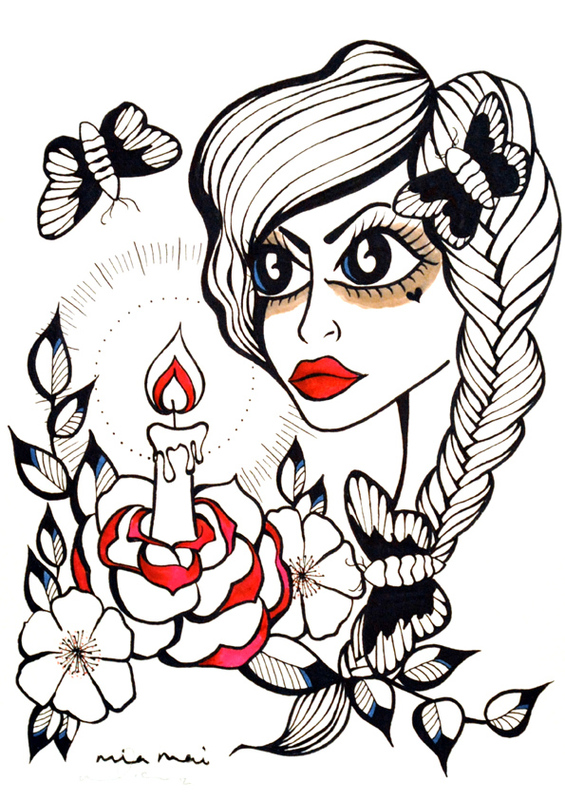 She held her first solo illustration exhibition last year in Southsea entitled ‘Ink’, selling originals and prints. One fascinating angle on this is that Ami offers a bespoke illustration service where one can have a posed pin-up style portrait of oneself themed on something the person is interested in. For example a wife or sweetheart might commission a pin-up portrait for her loved one themed on a particular aspect of their life together. Ami tells me she can turn her hand to most ideas people come up with. She can also print her illustrations onto fabrics and garments as needed. As regards fashion Ami designs and creates using vintage fabrics and also customises modern and vintage garments into her own unique style. She has a refreshing opinion on fashion in general, saying “I respect people who have the confidence to wear what they want. It’s refreshing to see someone embracing what they love and not just following the current trends. I think it’s important that parents encourage their children to think for themselves and not feel they need to be the same as everyone else and follow the crowds. If you like something go with it, wear it and you will feel good in it. It’s sad to see people who haven’t got the confidence to do things their own way and just do what they’re told to do by fashion magazines and what the shops are selling. If I could give any advice I would encourage people to mix their wardrobe up with classic garments, vintage pieces and the odd thing from the current market you just ‘need to have’ and to have fun with fashion.” Last year Ami created a lingerie collection that was debuted at Southsea Fashion Week. The event was delivered with an insouciant panache that suited the vintage feel of the event and went down extremely well with the audience. To find out more about Amy and her work visit www.miamai.co.uk Her contact details are ami@miamai.co.uk or 07896 818806.